Saturday question (followed by Sunday Q and analysis): Does the US government issue the USD? For those of you who answered “YES” to the previous Q (34 people max can answer this Q): do taxes and bond offerings finance the US gov? While it is true that the US Treasury lost (most) of its monetary creation power, Government here means US Treasury and the Fed. Consolidating Fed&Treas is also a common modeling strategy to simplify analysis. 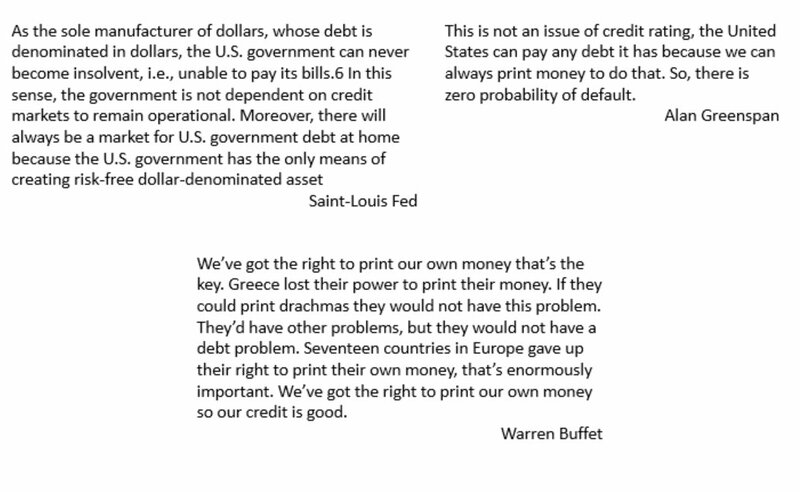 Then yes the US gov print the currency AND you MUST also agree that taxes and U.S. gov bonds do not fund the US gov. It is an implication of consolidating Treasury and central bank into the U.S. Government. Treasury and central bank are put into one balance sheet and so all claims they have against one another are eliminated. 5-fear waste, regulatory capture, cronyism. don’t fear monetary financing. 6-Aim at a gov of the people, by the people, for the people. Oharra: Moneta erabiltzaileko gobernua, kasu, euroguneko herrialde kideen edozein gobernu, moneta jaulkitzailea Europako Banku Zentrala da. Herrialde kideek ezin dute moneta jaulki. Kasu hau sakonki ikusi dugu blogean. Erantzunik dotoreena Warren Mosler-ek eman du: ikus Options for prosperity – Warren Mosler (for ICEC – Basque Countries), in From Vocale Europe to ICEC-Euskal Herria. Wouldn’t it be great if America had a fiat-money system? 1. The sovereign U.S. government declares that every citizen and business must, on a regular and recurring basis, pay taxes to the government (or incur a harsh penalty). 2. The government next declares that the only thing it will accept as a tax payment is a particular kind of “fiat-money” which only the government, itself, shall have the right to issue (which is why it’s called “fiat-money”). 3. After these declarations, U.S. citizens and businesses find themselves, instantaneously, with a strong desire to acquire the government’s fiat-money to avoid the harsh penalties of being tax delinquent. 4. In order to satisfy this desire, the government then exercises its declared right and issues the fiat-money—either electronically or with a printing press—and then spends the fiat-money into the private economy so the citizens and businesses can acquire it. 1. It can directly purchase goods and services from the U.S. citizens and businesses. The government could, for example, purchase the services of the citizens to build a highway, or a bridge—or it could pay the citizens to teach children to read. 2. The government can mail a check, or electronically deposit fiat-money directly into the bank accounts of citizens who, because of disability or old-age, are unable to work to obtain the fiat-money they need. 3. The government can direct its central bank (which manages the creation of the fiat-money) to automatically, at the end of each business day, issue and make available to the private banking industry whatever new fiat-money is necessary to monetize the profits private industry has generated during that business day. 6. After it has spent enough of its fiat-money into the private economy, the government then makes good on its declared intent: it collects taxes from the citizens and businesses. Now they know the government means business, and will continue to want to earn the fiat-money it issues so they can pay their taxes next time around as well. 7. The difference between the amount of fiat-money the government issues and spends and the amount of fiat-money it collects in taxes would be called the “Citizen’s Net Gain” (CNG)—because it is the amount of fiat-money the citizens get to keep after they’ve paid their taxes. 1. It can increase the amount of fiat-money it collects in taxes, thus draining more of the excess CNG out of the economy. 2. The government can create special interest-bearing savings accounts which the citizens and businesses can put their excess CNG into, thus removing a large quantity of fiat-money from chasing goods and services, and replacing it with a much smaller quantity of fiat-money (the interest payments on the savings accounts). 3. The government can direct its central bank to discourage the borrowing of money through the banking industry, which will reduce the amount of private sector profits needing to be monetized. That’s it. Those eight steps would be the basic workings of an American fiat-money system. Now that it’s been properly explained, just imagine for a moment what this fiat-money system is able to do. If you’re a business, the system can create fiat-money, as needed, to monetize your profits. If you’re a citizen, the system can create fiat-money to pay you to provide all kinds of useful goods and services to your local community. If you’re a politician, you can propose the government should undertake the accomplishment of some grand and important task—such as providing every citizen with a free and complete education, or providing every citizen with free health-maintenance—without having to explain “how you’re going to pay for it,” because issuing and spending fiat-money for those kinds of things is what the sovereign government is supposed to do in order for the fiat-money system to properly work. It really does send tingles of exciting possibilities up and down your spine, doesn’t it? But now let’s stop day-dreaming. Let’s wake-up to the hard-nosed reality that the American fiat-money system we’ve just imagined is…—wait a minute! It’s the American fiat-money system we already have! The only difference between the money system we’ve imagined and the one we are actually using is the terminology we apply to it. We call the government’s particular fiat-money “U.S. dollars.” We call the “Citizen’s Net Gain” our federal budget “deficit.” We call the savings accounts the government makes available to citizens and businesses “Treasury bonds”—and we imagine the government is “borrowing” the dollars being deposited in them. Finally, we call the amount of fiat-money that has been sequestered in the Treasury bond savings accounts our “national debt.” Other than these minor differences in terminology, our American money system is exactly the fiat-money we’ve just imagined. The terminology differences, however, have an extraordinary impact: They make it extremely difficult, if not impossible, to rationally use our fiat-money system to accomplish the things we need accomplishing. It’s like trying to drive a car with all the pedals mislabeled and the steering gearbox turned upside down: the accelerator is called the “brake,” the “brake” is called the accelerator, if you turn the steering wheel counter clock-wise, the car veers to the right, if you push the gear shift to “D,” the car shoots backward. And meanwhile, the backseat is filled with car-experts and pundits explaining why all the misleading labels are correct, and how everything is supposed to work in the confusing, dysfunctional way that it does. To restate my opening question, then: Wouldn’t it be great if we had an American fiat-money system that our politicians and economic pundits actually knew how to drive?